If you have pet’s in your home, you’ve certainly had to deal with pet odor treatments for carpet a time or two. Here are several DIY pet odor treatments for carpet that you can use prior to calling an expert. After that, we’ll go into pet odor treatments for carpet that a carpet cleaning company may offer. Most people will use the DIY options for accidents that happen in between professional cleanings. Before we begin, you should know that pet urine is very sticky. It’s a challenge for professionals to remove. Be wary of anyone who says they can get 100% of pet urine out of your carpet. Take it from an expert, that’s a promise that just can’t be kept. The good news is the odor can be neutralized with the right treatments. Urine can travel to the back of your carpet, the padding, the sub-floor, and even the baseboards. 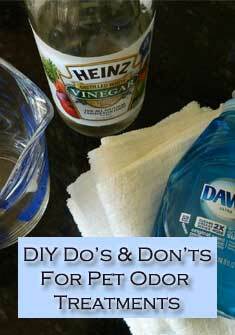 The best DIY pet odor treatments for carpet are going to be vinegar, baking soda, or blue Dawn dish soap. Try keeping a 50/50 mixture of white vinegar and water in a spray bottle and use that to clean up occasional pet accidents. Just spray the area and then stand on it with paper towels or a clean, white cotton towel. The vinegar won’t leave a soil attracting residue in your carpet and it will assist in treating the pet urine odor. You can also sprinkle baking soda on your carpet an hour prior to vacuuming. This is one of those pet odor treatments for carpet that may help with ongoing odor issues. For poop accidents, you’ll want to remove all the solid material from your carpet. Next, mix up 1 Cup of warm water with 1 tsp. blue Dawn dish soap. Add 1/4 Cup of vinegar to assist with treating the odor. The blue Dawn is a gentle soap that is most effective when freshly mixed with water. Spot clean the problem area with a clean, white cotton washcloth. If you have a Bissell steam cleaner or something similar, fill the solution reservoir with 25% vinegar and 75% water. This is a great DIY cleaning solution for carpets with pet urine issues or occasional poop accidents. There are a lot of DIY pet odor treatments for carpet across the internet. You’ll want to avoid products that can permanently change the color of your carpet such as bleach, hydrogen peroxide, and cleaning products with color (blue Windex). Avoid over the counter cleaning products that are designed to clean up pet accidents. These end up leaving a soapy residue in your carpet, that will eventually attract dust and soil. What you’ll end up with is a brown spot on the carpet made up of urine, cleaning product and dirt. Not pretty. Don’t used colored towels when spot cleaning your carpet. It’s not likely, but the color can transfer if you have light colored carpet. Carpet cleaners have a lot of experience with pet odor treatments for carpet. If you have pet urine in your carpet, expect to pay an additional fee to have it treated properly. The reason is that urine is not removed with carpet cleaning alone. It takes a different cleaning product to break it down and strip it from the carpet fibers. Not treating for urine during a professional carpet cleaning can intensify the odor. When high temperature steam hits concentrated, dried urine it’s like re-activating all the pet accidents at once. Again, not pretty. With so many advances in cleaning product technology, most pet odor treatments for carpet are now topical – this means applied to the surface of the carpet. Severe cases may require a more intense treatment where the affected area is flooded out with a unique solution. This type of treatment ends up flushing the entire carpet including the backing and pad, all in one step. The steam and cleaning product are removed with sub-surface extraction. Both of these pet odor treatments for carpet are very effective in removing the urine, if good cleaning products, odor neutralizers, and proper equipment are being used. In years past, professionals would treat severe situations by pulling up the carpet, replacing the pad, treating and sealing the sub-floor, cleaning and treating the front and back of the carpet, and finally reinstalling the carpet. This type of treatment is still be done but not nearly as often as it used to be. Technology has just advanced past it. You’d never know it, but most American homes are in need of pet odor treatments for carpet. The DIY options listed above are great options to use in between professional cleanings. If you have questions or need a suggestion on how to treat a pet accident, call your local professional. Most local carpet cleaners are happy to offer professional advice.